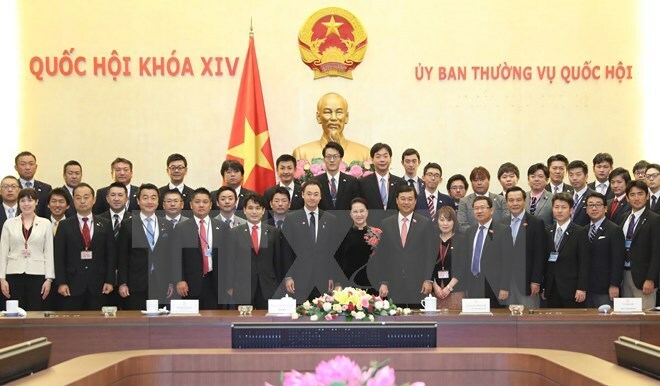 Hanoi (VNA) – National Assembly Chairwoman Nguyen Thi Kim Ngan has expressed her hope that young Japanese parliamentarians will contribute to deepening the Vietnam-Japan relations at a reception in Hanoi on August 23 for a delegation from the Liberal Democratic Party’s Youth Division. Intensifying cooperation with Japan is one of the priorities in Vietnam’s foreign policy, she affirmed, adding that high political trust is a firm foundation for close and effective cooperation between the two sides. Ngan took the occasion to thank Japan for providing official development assistance (ODA) for Vietnam, which, she said, has helped the country boost socio-economic development and reduce poverty. She spoke of the initiative to organise a seminar between the two countries’ young parliamentarians as it contributed to strengthening their mutual understanding. The top legislator asked the two sides to maintain visits and meetings, improve the role of MPs, especially young and female lawmakers, and coordinate closely in holding activities celebrating the 45th anniversary of the bilateral diplomatic ties in 2018. It is necessary to step up economic and trade cooperation, facilitate Vietnam’s export of aquatic products and fruits to Japan, and promote Japan’s investment in Vietnam in the fields of support industry, manufacturing, energy and agriculture, she noted. Keisuke Suzuki, head of the Liberal Democratic Party’s Youth Division, informed the host of the outcomes of the seminar between his delegation and young Vietnamese deputies. According to him, the regular organisation of exchange activities between young parliamentarians will help the two countries’ young generations improve mutual understanding and contribute more to the bilateral relations.